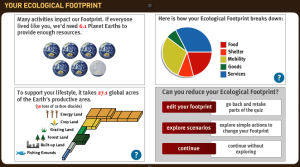 Do you know what the impact of your footprint is? I didn’t until about five minutes ago. I try to make good decisions, I recycle, I turn the lights off, I try not to let the water run too long. On the other hand, I don’t take public transportation, we travel, we eat meat and I have no idea how far our food travels to get to us. I’m shocked at the level of my impact. The questions are general so it is not exact, but I got the point. Here are my results to the quiz. 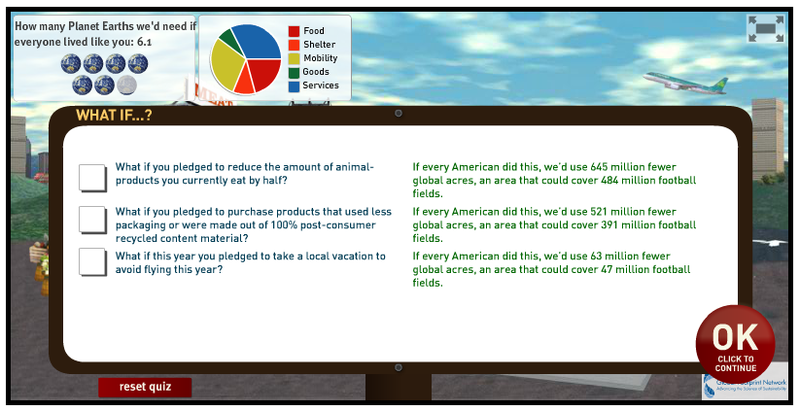 It says if everyone lived like I do, we would need 6.1 plant earths. Oy! The second image shows what it would look like if we made a change to our routines. I’m going to take some time over the next couple weeks to find simple ways to begin minimizing our impact. More to come. In honor of the upcoming Earth Day, Calculate your footprint, http://www.earthday.org/footprint-calculator. It only takes about five minutes.